long term challenges of climate change and particularly unprecedented climatic events. Climate Smart Agriculture (CSA) has emerged as a new framework that links climate change and agriculture development initiatives and aims to establish agriculture systems that simultaneously increase productivity, enhance resilience, and reduce emissions. Innovating around the CSA concept has the potential to generate new models for climate change planning and new investment pathways for agriculture from the local to global levels in the face climate change and climate variability. Innovation is a process allowing the adoption of new practices or ideas resulting from the alignment of technical, social, institutional, and organizational dimensions. Fostering a process of innovation around CSA practices implies taking into account the collective nature of innovation, understanding bottlenecks and identifying opportunities for enhancing the innovation capacity of agricultural systems. Multi-actor innovation platforms can be defined as networks intended to strengthen interactions between actors in order to facilitate change that enables innovation. This project aims to strengthen the adaptive capacities of family famers to climate change and climate variability through the development of innovation platforms at the local level that provide solutions for mainstreaming priority CSA options. Three main purposes will be addressed: (1) to identify the most efficient, effective, and equitable structure for innovation platforms dedicated to mainstreaming CSA in Honduras and Colombia, (2) to strengthen or initiate a process of adoption of CSA options at the local level through a participatory process that includes collectively designing innovative practices taking into account local practices and knowledge, and (3) To conduct ex-ante and ex-post assessments of CSA options, and identify changes needed to local institutions to support adoption. This project is organized in five components. Component 1 (Project Coordination) aims to coordinate project activities and establish interlinkages and communication between project partners and local stakeholders involved in the innovation platforms. Component 2 (Innovation Support) is transversal to all the components of the research and aims to involve farmers, extension agents, researchers, and other local actors in co-innovation platforms that promote training, definition, experimentation, and appropriation of CSA technologies by local communities. Component 3 (Feasibility and Trade-offs Evaluation) aims to inform stakeholders about the outcomes that can be expected from implementing the practices and will be based on the use of a whole farm model. Component 4 (Testing CSA Options and Alternatives to Scale Out Adoption) aims to evaluate the applicability of collectively selected CSA practices through participatory on farm experiments, and assess the local institutional and organizational changes needed to support and incentivize the process of adoption. Component 5 (Assessment of CSA Prioritization) aims to evaluate the link between local priorities that will be identified from this FONTAGRO project and national priorities or prioritization processes currently conducted under the CGIAR Climate Change, Agriculture, and Food Security (CCAFS) research program in Honduras and Colombia. The main expected results are (1) lessons on how co-innovation platforms for CSA adaptation can be constituted and supported to optimize functionality, (2) prospective evaluation of the role of different CSA alternatives in adapting smallholders farmers to climatic change, (3) local practices used to cope with climate variability and risks strengthened, (4) local students trained, and (5) modifications suggested for national level prioritization processes to link with local social, environmental, and economic realities. A large range of activities will be conducted. The main activities will be: (1) the participatory design of innovation platforms dedicated to mainstreaming CSA with local stakeholders interested in participating in CSA activities in the target region, (2) participatory model-based evaluation of trade-offs under climatic and economic scenarios and CSA practices, (3) participatory experimentation with farmers of collectively selected CSA options, (4) collective testing of organizational changes intended to support an adoption process of CSA option, and (5) assessing of the prioritization processes. The project will be conducted in Santa Rita in Honduras and Los Cerillos in Colombia and will involve of local actors of these sites interested to support adaptation of smallholders to climate change including actors from private sector. The project will be aligned with the CCAFS program (flagship 1.1: Establishing a robust participatory climate-smart practice and technology evaluation platform for Latin America) whose main objective is to establish a regional platform between 4 countries of Latin America (Colombia, Nicaragua, Honduras, Guatemala, Peru, El Salvador) to strenghten interaction between local actors, national research centers, privates actors, and NGO for improved decision-making and CSA scaling-up.The duration of the project will be of 24 months. The estimated funding of the project is of USD 400,285 with the amount requested to FONTAGRO being of USD 200,000.
varieties, adjustment of amounts of inputs and of the schedule of activities, and diversification of cropping systems, livelihoods, or landscape use. While many of these practices may help farmers adapt to future climate change, new adaptations strategies will also be needed for farmers to address short and long term challenges of climate change and particularly to cope with unprecedented climatic events. Vermeulen et al. (2013) identified the need for incremental, systemic, and transformative changes at the farm level given the intensity of expected climate change impacts. Climate Smart Agriculture (CSA) has emerged as a new framework that links climate change and agriculture development initiatives and aims to establish agriculture systems that simultaneously increase productivity, enhance resilience, and reduce emissions (FAO, 2010). The CSA concept explicitly addresses the tradeoffs between these three goals, aiming to achieve food security objectives equitably and sustainably. Innovating around the CSA concept has the potential to generate new models for climate change planning and new investment pathways for agriculture from the local to global levels in the face climate change and climate variability. In the framework of the work carried out under the CGIAR Climate Change, Agriculture, and Food Security (CCAFS) research program, Climate Smart Agriculture practices and investment portfolios are currently under prioritization by policy makers and national stakeholders. The first prioritization exercises conducted at the national level, allowed national stakeholders to select practices adapted to the diversity of agroecological contexts and for farms to invest in new practices such as seed banks, conservation agriculture, and water conservation practices chosen from an initial set of practices found in the literature or proposed by stakeholders. Strategically selecting practices to invest in is only one step in achieving their adoption or in other terms to foster innovation and especially farmers’ capacities to innovate. The introduction of these practices at the farm level implies specific reframing of current production systems and activities (Rodriguez et al., 2014). Furthermore innovation is generally enabled or constrained by the social, economic, and institutional environment. A major challenge will be identifying barriers and pathways to overcome and to scale out adoption (Douthwaite et al., 2003) of CSA practices as well as ensuring integration with local production systems and knowledge to ensure they address local contexts and needs. 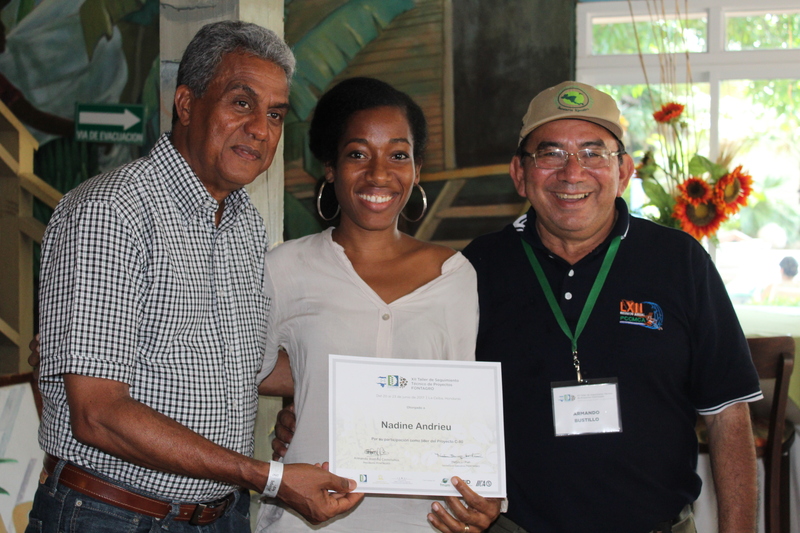 To identify the most efficient, effective, and equitable structure for innovation platforms dedicated to mainstreaming climate smart agriculture in Honduras and Colombia. To strengthen or initiate a process of adoption of CSA options at the local level through a participatory process that includes collectively designing innovative practices taking into account local practices and knowledge. Conduct ex-ante and ex-post assessments of CSA options, and identify changes needed to local institutions to support adoption. The Project will be conducted in two sites located in areas with contrasted agrocecological and socioeconomical characteristics. In Colombia the study site will be in the Cauca region and particularly the zone called Los Cerrillos producing mainly maize, beans and vegetables. In Honduras the study site will be Santa Rita located at the intersection of two other countries (Guatemala and Salvador) and producing maize, beans and coffee. The study sites are respectively located in two of the megadominios defined by FONTAGRO (1) V “Sistemas Altos Andinos”, (2) VIII “América Central y Sur de México”. These two sites have been selecting because of their vulnerability to climate change, previous works of CIAT, its partners, and local institutions on climate change since both are pilot sites of the CCAFS program, that means sites were CIAT and its partners are experimenting solutions for addressing short and long term challenges of climate change. The comparison of generic outcomes from these contrasted areas will allow producing knowledge for other regions of Latin America and Caribbean (particularly those that will be involved in the regional platform intended to be supported by the CCAFS program as El Salvador, Nicaragua, Guatemala, and Peru). Figure 1 illustrates the conceptual framework of the project and articulates the links between components. The project process will be simultaneously conducted in the study sites of Honduras and Colombia. Component 1: Project Coordination. This component aims to coordinate project activities through the implementation of steering and advisory committees. It also aims to establish inter-linkages and communication between project partners and local stakeholders involved in the innovation platforms through workshops, meetings and videoconferencing to provide quality assurance of deliverables and reporting to FONTAGRO. Component 2: Innovation Support. 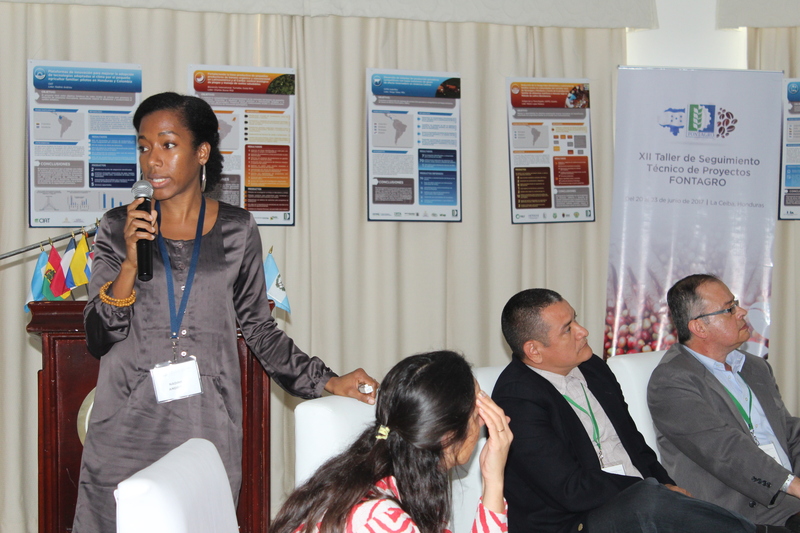 The main objective of this component is to involve farmers, extension agents, researchers, actors from the private sector, and other local actors in one local coinnovation platform per study site that promote training, definition, experimentation, and appropriation of CSA technologies by local communities, bridging the gaps between research and extension, public and private sectors, and between national priorities and local realities. These platforms will be adapted to the specific characteristics of the study sites (types and needs of the local stakeholders). One important function of the innovation platform will be to enhance the capacity of local stakeholders to analyse, experiment, evaluate, and finally develop innovative solutions to existing challenges. This component will be transversal to all the components of the research in order to create iterative learning opportunities. Component 3: Feasibility and Trade-offs Evaluation. 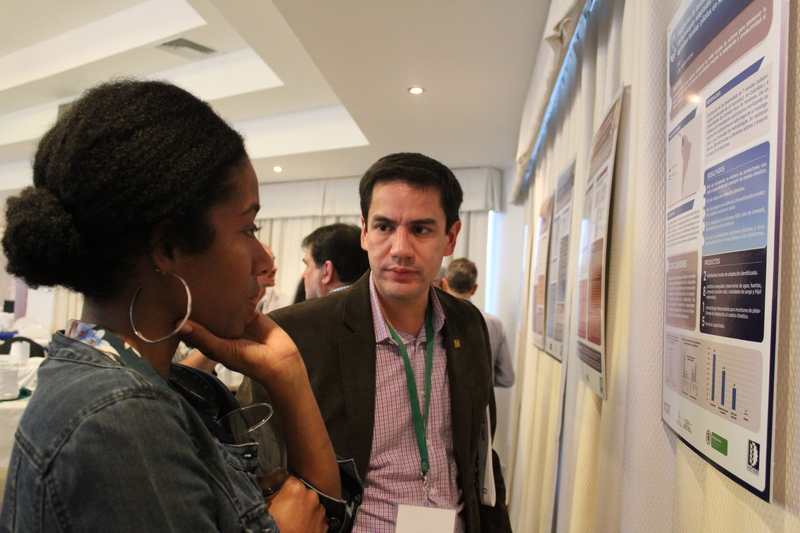 This research will complement research conducted by CCAFS and CIAT on a national level CSA prioritization processes in Colombia and Honduras. National stakeholder forums will have selected portfolios of prioritized CSA practices. The local innovation platforms in this project will be integrated across activity sets 1 to 5 in order to analyse how to co-design CSA practices, assess links between nationally prioritized CSA options with local practices and priorities. The section below outlines the sets of activities to be conducted with each component. The numbering of each activity links with the related component. meet twice a year, in person during the Global Workshops, and by videoconference through the year, to provide a route for feedback and reflection so that opportunities for adaptive management can be actualized. Activity 1.2: Organization of Global Workshops involving all partner institutes to be held at project inception (month 2) and upon project completion (month 24) to allow a comparative analysis between case studies and synthesis of the results. Activity 1.3: Coordination of the activities conducted in each country by the Ministries. The Ministries will ensure that all the components of the project are properly conducted and that local stakeholders are involved. Activity 2.1: Identification of local stakeholders’ organizations (research, training, extension, NGO, local institutions and private sector) either participating in ongoing CSA activities or that would be interested in participating in CSA activities in the target region: interviews, review of literature, and social network mapping. Activity 2.2: Review of different experiences with agriculture related Innovation Platforms (for sustainably intensify the agricultural systems), especially in the target regions, to document previous mechanisms for establishing partnerships: interviews, review of literature, and social network mapping. Activity 2.3: Iterative training of local stakeholders on CSA practices, modeling, and analytical tools that will emerge from the process: organization of training sessions and testing on their impact on stakeholders’ knowledge and behaviour. Activity 2.4: Participatory design of innovation platforms dedicated to mainstreaming CSA with local stakeholders interested in participating in CSA activities in the target region: collective definition of the goals, structure, rules of functioning, facilitator, associated facilitation tools, and activities for the platform. Activity 2.5: Implementation and facilitation of the Innovation Platform with the specific facilitation tools: execution of activities defined collectively. Activity 2.6: Participatory and iterative assessment with local stakeholders of innovation platform as an effective and efficient tool for mainstreaming CSA: initial and final assessment of farmers’ knowledge, behaviour and practices, mapping of sources and flows of knowledge between the members of innovation platforms during the meetings to assess and engage entry points for knowledge sharing and innovation, assessment of the existence of a dynamic of implementation of organizational changes. For each of the components, different sets of results are expected. The numbering of each expected result (ER) refers to the related component.